Mark Brooks Hobbs, son of Lawrence Hobbs and Helen Evelyn Brooks. 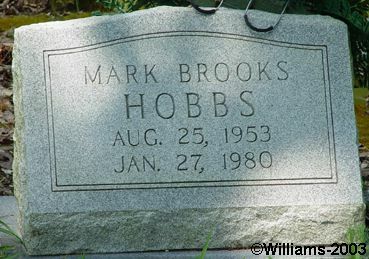 Mark B. Hobbs, 26, of Route 6, Cartersville, died suddenly January 27, 1980. Mr. Hobbs was a native of Bartow County, a member of the Mt. Pisgah Baptist Church and was a motorcycle salesman. Survivors include his mother, Mrs. Evelyn Brooks Dodge, Cartersville; his father, Lawrence Hobbs, Jr., Dayton Beach, Florida; grandparents, Mrs. W.J. Brooks, Cartersville and Mr. and Mrs. Lawrence Hobbs, Sr., Atlanta; a number of aunts, uncles and cousins. Funeral services were held at 2 p.m. Tuesday from the Center Baptist Church with the Rev. Bill McStotts and the Rev Harold Howell officiating. Interment was in the Old Macedonia Cemetery. Serving as pallbearers were Greg Thacker, Lawrence Bennett, Michael Chapman, Ken Smith, Jess Payne and Lewis Smith, Jr.
NOTES: Mother remarried. Last name at her death was Dempsey. Maternal grandparents William Joseph Brooks and Emergene Howell Brooks.